DIN rail mounted controller allows you to incorporate flammable, toxic or oxygen gas detection into control systems. Unipoint can be easily installed into any plastic or metal enclosure for use indoor or outdoors and even in potentially explosive atmospheres. 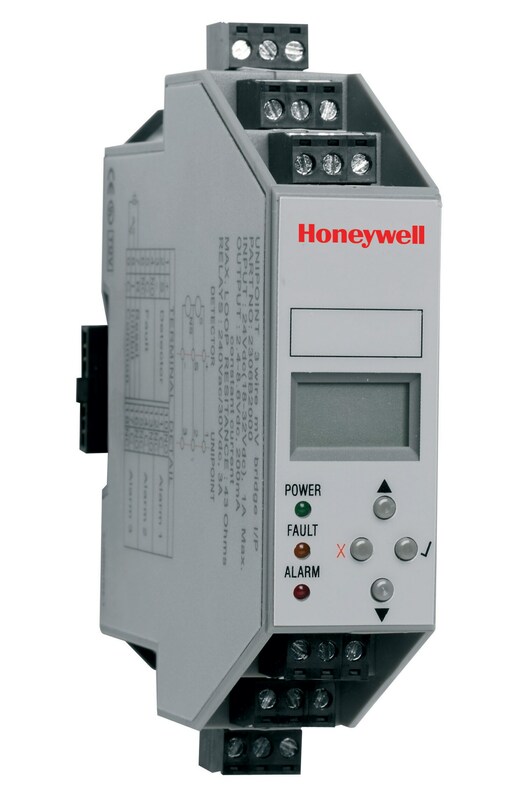 With the addition of one of Honeywell Analytics' range of flammable, toxic or Oxygen detectors, systems may be configured to monitor gases in a wide range of applications from car parks and boiler houses to analyser shelters or crane cabs in offshore facilities. Two versions of Unipoint are available; one for mV bridge, catalytic bead type, flammable gas detector and the other for any 2 or 3 wire 4-20mA type gas detector. Each Unipoint is easily installed onto the DIN rail via a special socket (provided) that also interconnects power to adjacent units. With removable terminal connectors, individual Unipoint controllers can be easily changed without disturbing other devices. By clipping together multiple Unipoints small to medium sized monitoring solutions can be realised. Each unit includes built-in audio/visual alarms, three programmable alarm relays and a fault relay. Gas concentration and system status is displayed on the backlit LCD and each controller is fully user programmable via an intuitive, push button operated menu system. Configuration menus can be password protected to prevent unauthorised access. In addition remote inputs allow accept, reset and inhibit of alarms without the need to open the enclosure that the Unipoint is mounted in. DIN rail mounted PSU. Input: 85-265Vac, 50/60Hz. Output: 24Vdc, 1A CSA, UL/UR, CE approved. How can I change my language preference? Simply click on the arrow pointing down next to “LANGUAGE” in the red bar at the very top of the page. A drop down list will appear and you can select any language from the list. Where can I find technical documents for products that are no longer available? Our Technical Library has all the documents you’ll need for current and legacy products. Select the “Legacy Product” filter in the left-hand column to find the documents for your product. If you still can’t find the information you need, visit the Contact Us section of the website and a service representative will be glad to assist you.